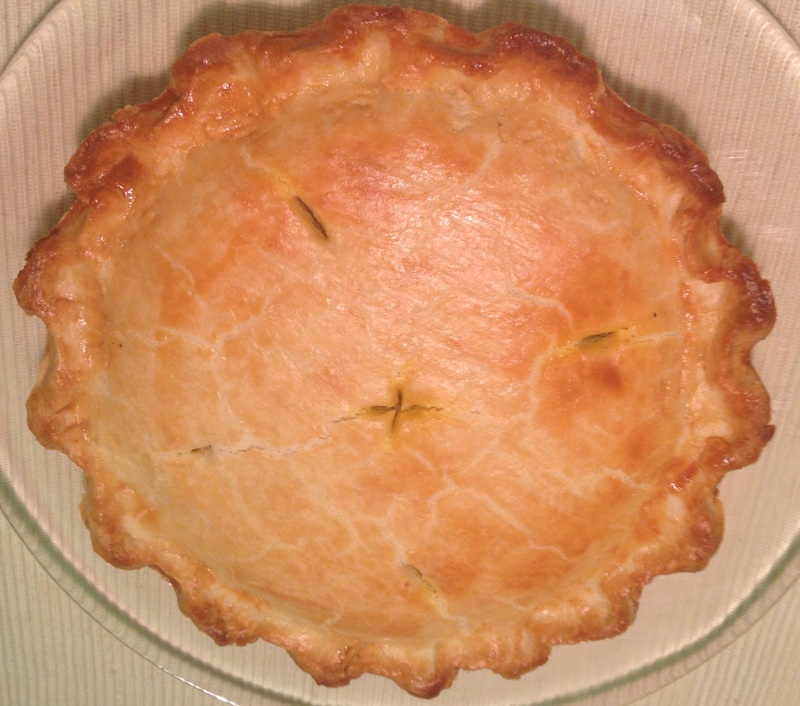 There are many recipes out there for pie crust….with or without egg, with yogurt, with vinegar etc. The ratio of flour to butter or shortening is also very important. The perfect crust as made by professionals use ½ cup butter to 1 ½ cups flour. Saute chopped onions, capsicum, garlic, ginger till onions are translucent. Add tomatoes, salt and pepper and mix well. Add minced meat, green peas, barbecue sauce, oregano and saute till the mixture is almost dry. Take off fire and let it cool a bit. In the meanwhile, make pie crusts. 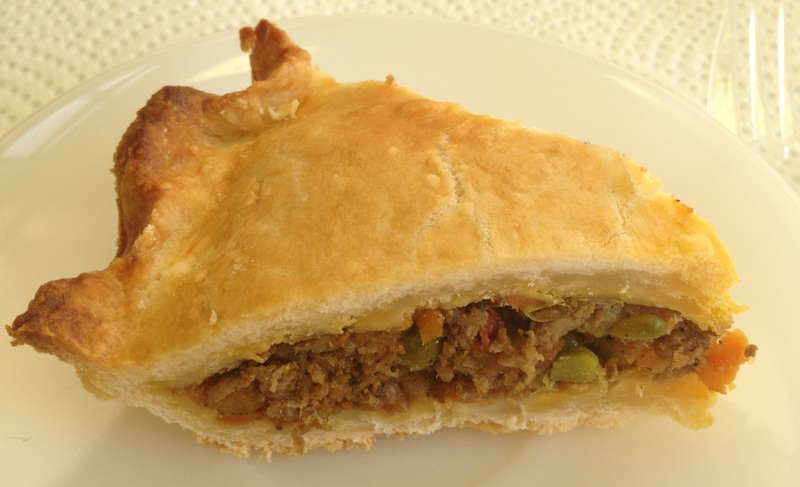 You can make pie crust dough either with hand or a food processor. Of course, with food processor, the whole process takes less time. If you use hand to make the crust, work quickly and make sure butter doesn’t melt. Add flour and salt to the food processor bowl. 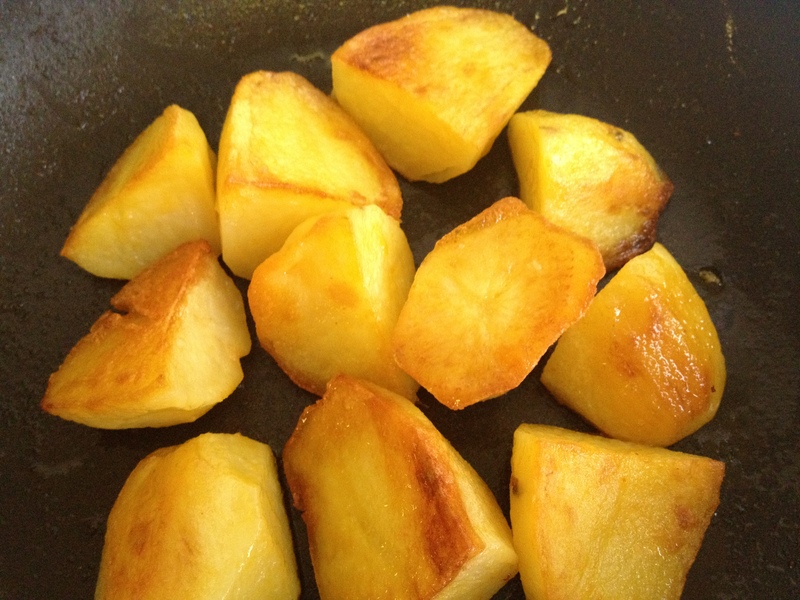 Cut the butter into 8-10 cubes and add to the bowl and pulse till butter is chopped to small pieces. It’s ok if few big pieces remain. Add ice cold water little by little and pulse. It should not become dough in the processor. Squeeze little with your hand and see if the dough holds shape. Divide into 2 and wrap in a cling wrap and refrigerate for 1 hour. Keep the dough at room temperature for 5 minutes to make rolling easy. Roll one piece of dough into 8” or 9”circles and carefully place on the pie plate. Flatten with your hands so sides are covered. 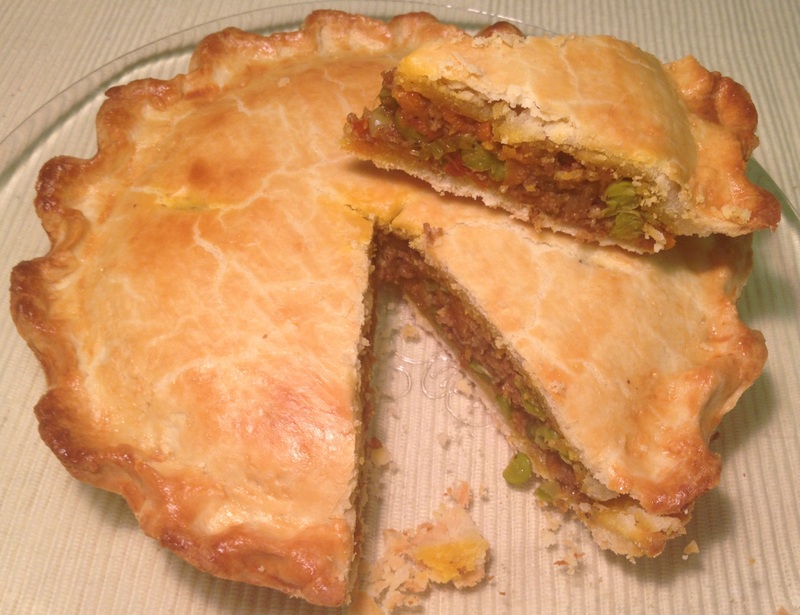 Put the filling on the pie and spread evenly. Roll the other dough and place on top of filling. Join the edges and use your thumb and forefinger to form curve shape. Brush the surface with egg wash and make 3-4 small slits with a sharp knife to let the steam escape. Bake in preheated oven at 170 degree Celsius for 35- 40 minutes. The top would have become a golden colour by now. Cool a little before you slice and serve. The butter should be very cold and should not melt during the process. Cut into cubes and freeze for a while before adding to the flour. You can even grate the frozen butter into the flour. The water too should be very cold; preferably add ice cubes in it. This is an absolute easy and delicious recipe. I would recommend preparing it a day before it is to be served…..if it can last that long! Wash the mutton pieces and keep on a strainer so all water runs out. Heat oil and add onions. When onions become translucent, add ginger, garlic and curry leaves and saute till all becomes golden brown. 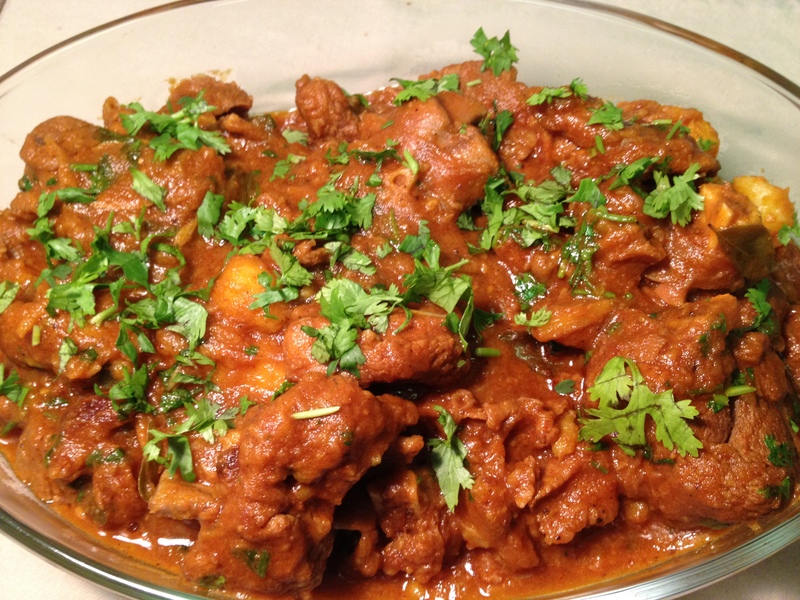 Add coriander powder, chili powder, turmeric powder, garam masala and stir well for few minutes. 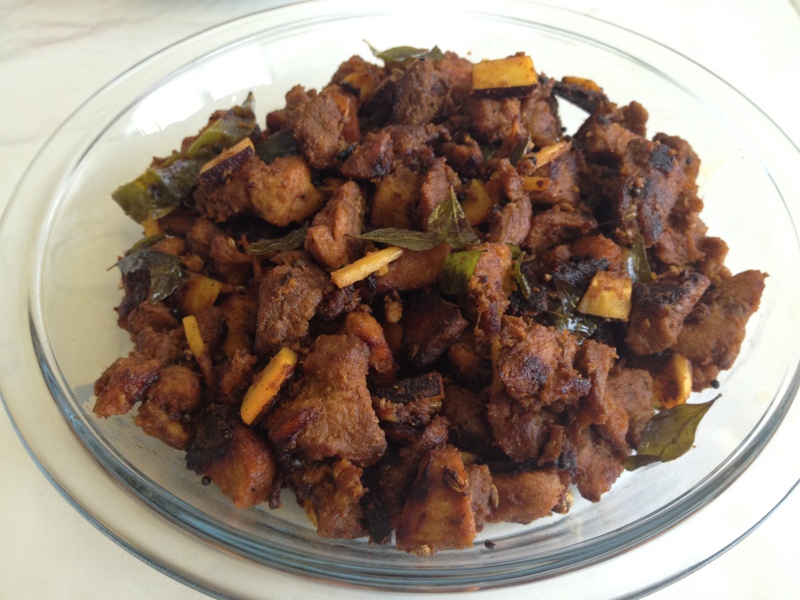 Add mutton pieces and keep stirring on high flame for 5 minutes. Add 5 cups boiling water and add salt and turn the flame to medium. 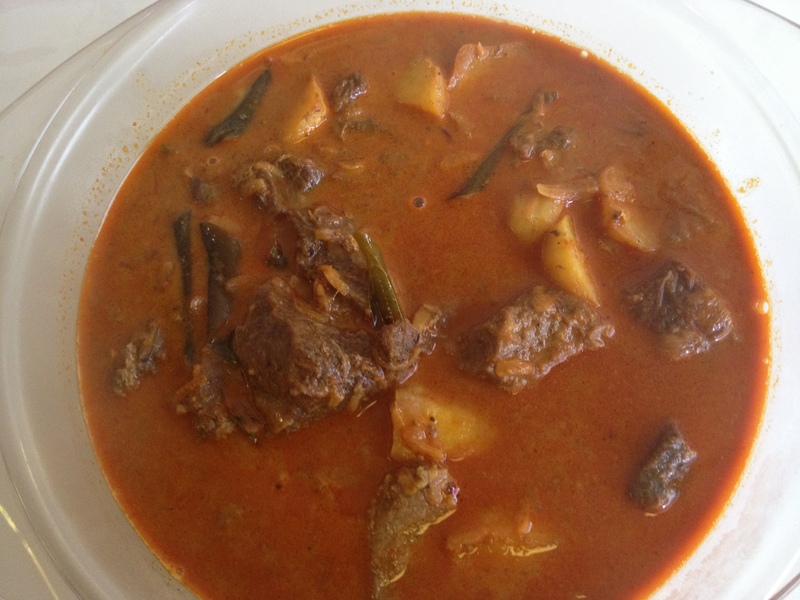 Cook till mutton is cooked and soft and the gravy is thick. 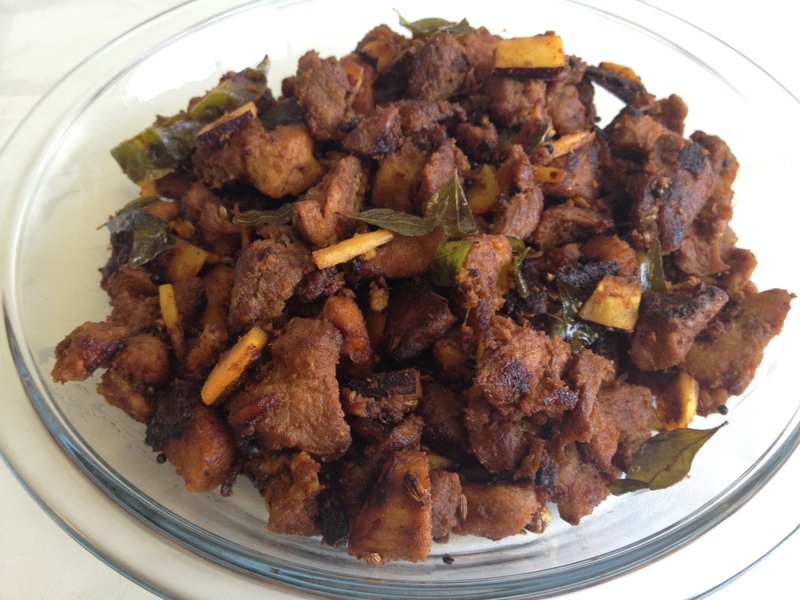 Serve with sookha Chapathis (chapathis with no oil). Yummy. 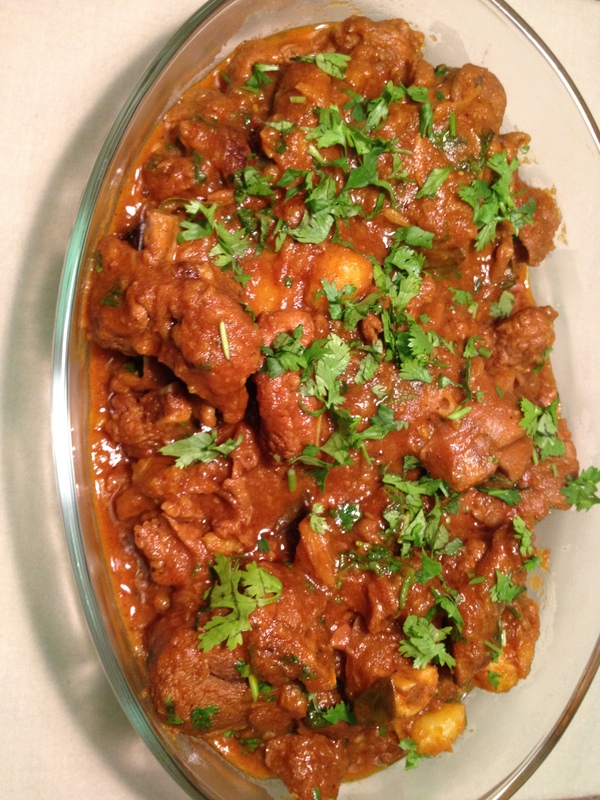 In a pressure cooker, add beef, coconut, onion, ginger, 3 tbsp garlic, chili powder, turmeric powder, coriander powder, garam masala, pepper powder and salt and mix well. Heat oil and add mustard, cinnamon, cardamom and cloves. When it splutters, add fennel and stir. Add the rest of garlic slices, curry leaves and green chilies. Stir till garlic starts to brown at edges. Add the cooked beef and mix well. When the water evaporates completely, reduce the flame to medium and keep stirring once in a while till it becomes dark brown in colour. Check salt. Initially, the curry will be light brown in colour, but will become dark brown in the end. Fry on non-stick pan preferably to reduce oil. Sauteing onions to almost brown colour is important. Cook the first 5 ingredients in a pressure cooker for 3 whistles. 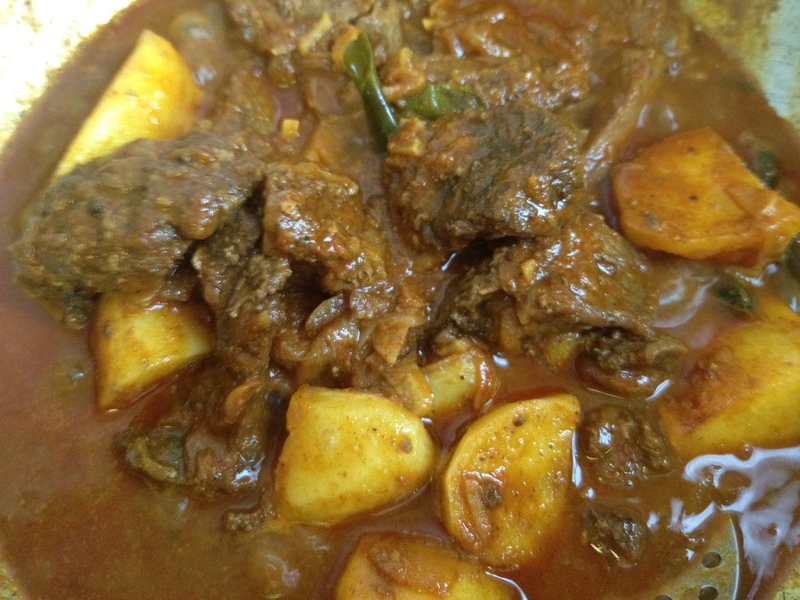 Those who are not using pressure cooker, cook the ingredients along with 1 cup water till the beef is cooked. Peel and cube the potatoes. Add 1-2 tbsp oil in a nonstick pan. Add the potatoes and saute them till all sides are lightly brown. 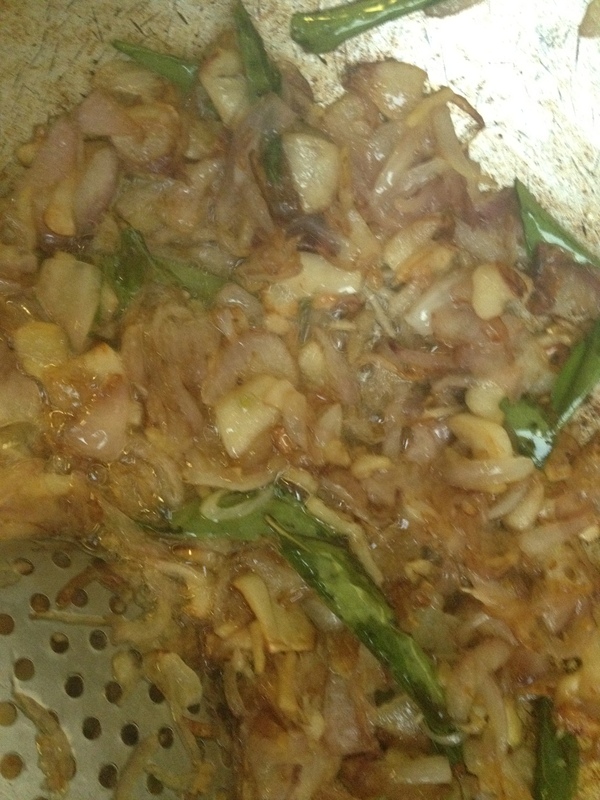 Heat oil and saute onions, ginger, garlic and curry leaves till onions become golden brown. Adding a little salt to the onions will brown the onions quicker. Add coriander powder, chili powder, fennel powder, turmeric powder, garam masala and pepper powder and saute well. 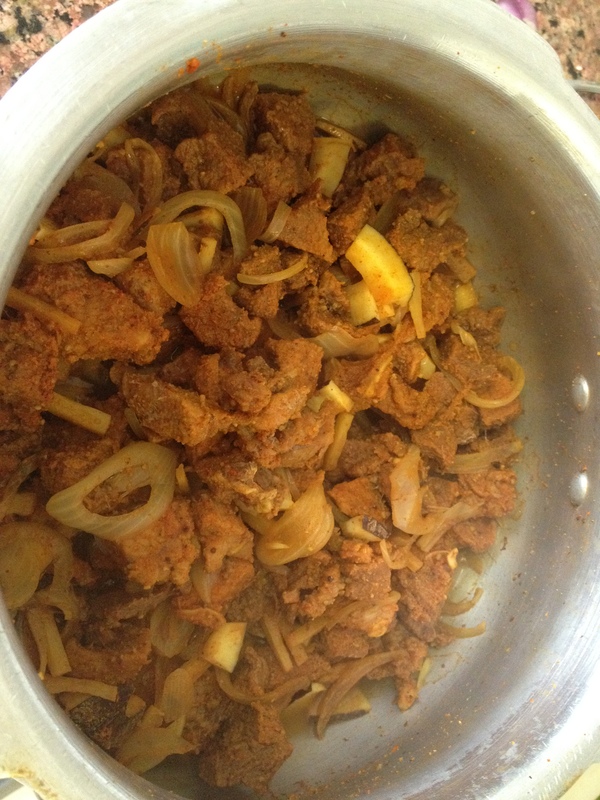 Add cooked beef along with the water in which it is cooked. Add potatoes. Adjust salt. Let it simmer on medium flame for 10-15 minutes till gravy reaches desired consistency and the curry attains a dark brown colour. Notes: If you add ½ cup thick coconut milk to the above, it will give you another delicious curry. 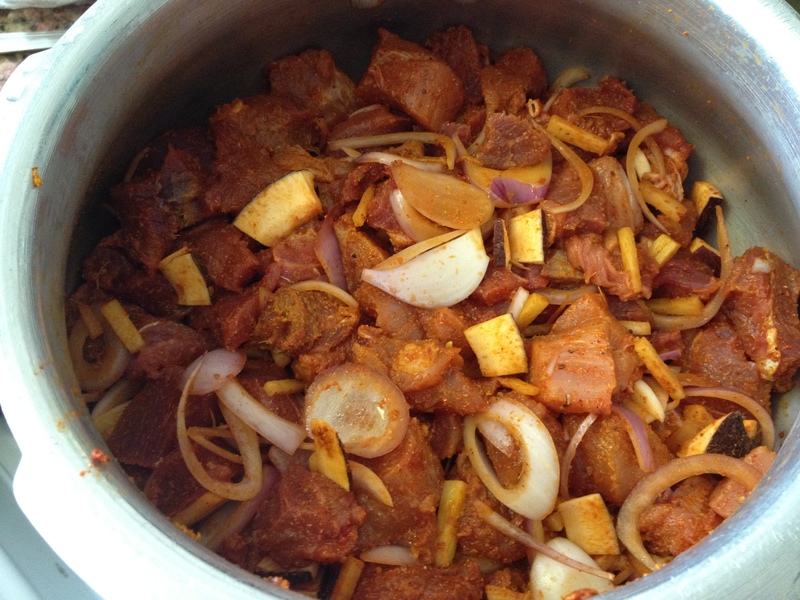 The below is with coconut milk…..